It has been exactly one year since we saved the Lars Homestead. We are still very much in awe of all the positive reactions we are still receiving via mail and on Facebook. Thank you, fans, for your continued support. Here you will find a day-by-day report of the endeavors of the Pioneers who went out into the Tunisian desert to restore the iconic movie locations for generations of fans to enjoy. Enjoy browsing this website and may the sand be with you! 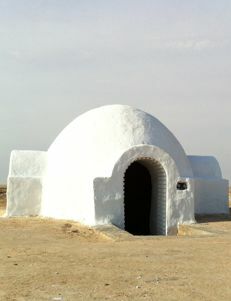 But the real life iconic movie location in the desert of Tunisia suffered badly from the harsch climate since it was rebuilt for the Prequels in 2002. If no action was taken, it was destined to disappear forever. We, the fans, could not let that happen. Check out the video that we showed during the Star Wars Celebration Europe II in Essen, Germany, here! Find out who who donated to make this restoration possible and meet the crew who traveled out to Tunisia to save the Lars Homestead. Re-live the adventure of lifetime in this 246 page hardcover book with over 700 never before seen full color photos. Includes artwork by Dave Dorman and Eric Siebeneck as well as a blurb from Mark Hamill AKA Luke Skywalker! Copyright 2012-present Mark Dermul. All rights reserved. Disclaimer.